Suman Ambwani, associate professor of psychology and noted researcher in the field of eating-disorder interventions, has been named the 2016 recipient of Dickinson’s Constance and Rose Ganoe Memorial Award for Inspirational Teaching. Class President John Dinsmore ’16 (international business & management) presented the award to Ambwani during Commencement on May 22. “She has made rich contributions to the college, both in and out of the classroom, as well as in her field of study,” Dinsmore said. Chosen each year through a secret ballot by graduating seniors, the Ganoe Award is the only student-bestowed faculty accolade at Dickinson. Established in 1969 with a bequest from the late William A. Ganoe, class of 1902, the award includes an honorarium and the opportunity to use funds from the Ganoe Memorial Fund to support teaching and research interests. Ambwani also has been selected as one of 83 faculty members throughout the U.S to receive the 2015-16 Exemplary Teacher Award from the General Board of Higher Education and Ministry, Division of Higher Education. The award includes a certificate of appreciation and monetary prize. It is presented annually to outstanding educators from United Methodist-related institutions. Ambwani started teaching at Dickinson in 2008. During the 2012-13 academic year, she served as fellow and visiting researcher at the prestigious Institute of Psychiatry at King’s College London, where she continues to conduct research on eating disorders with collaborators there. In service to Dickinson, Ambwani is a member of the strategic planning committee and chairs the all-college research and development committee. She also is faculty advisor to the Dickinson chapter of Psi Chi, the international honors society in psychology. 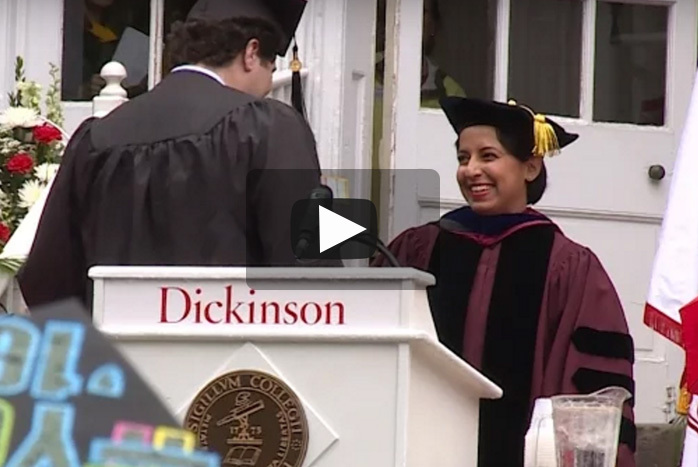 In 2014, Dickinson’s Division of Student Life recognized Ambwani’s outstanding support and mentorship of students by naming her advisor of the year. Her current research focuses on the development and evaluation of guided self-help interventions for people with anorexia nervosa, and understanding etiological and maintenance factors for eating-related psychopathology. Her work has won the support of the National Institute for Health Research, and she has authored or co-authored more than two dozen journal articles, book chapters and manuscripts. She also has presented worldwide on the topics of anorexia nervosa, body image and treatments and interventions for eating disorders. Ambwani holds a bachelor’s degree in psychology and sociology from Macalester College and a master’s and Ph.D. in psychology from Texas A&M University.